On June 17, 2017, Ted Allan passed away at the age of 88. He is survived by his son Gordon (Natalie); three grandchildren David, Kevin, Sarah; his daughter Judy (Tony Loconte); his sister Sandra Wasylchuk (Michael) and brother, Steve Allan (Marjie) of Calgary. He was predeceased by his wife Dorothy of 62 years in November 2016, his mother, Francis and father, Burritt. Ted was born and raised in Calgary. After completing his Bachelor of Commerce at the U of A in 1951, he joined the accounting firm of Peat Marwick and Mitchell. He qualified as a Chartered Accountant in 1954. In 1959 he was made partner and moved to Edmonton, retiring from the firm in 1987. Ted was awarded Fellow of the Chartered Accountants in 1973. Ted was very involved in his community and gave freely of time and expertise. He served as Treasurer on many boards and organizations, such as: the Kiwanis Club, the Board of Governors of the University of Alberta, Canadian and World Figure Skating Championships, Canterbury Foundation, 1983 Universiade Games, to name a few. Ted was also an avid sportsman and enjoyed badminton, tennis and squash. It was on the badminton courts in Calgary that he met his future wife Dorothy Dougall. He also enjoyed golf, downhill skiing and walking the dog. 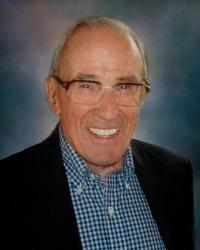 He was a long time member of the Mayfair Golf Club and the Royal Glenora Club. Ted and Dorothy were blessed to have a long retirement enjoying many years of travel all around the world. Special thanks to Ted’s GP, Dr. Gary Samycia and Orthopaedic Surgeon Dr. Guy Lavoie for their years of excellent care. Thanks also to the staff at 6E Orthopaedics at the Misericordia Hospital and 9Y Palliative Unit at the General Hospital. A Memorial service will be held at 3 pm Saturday June 24 at St. Timothy’s Anglican Church, located at 8420 145 St. Edmonton. In lieu of flowers, those wishing to do so may make a donation in Ted’s memory to the Edmonton Community Foundation for the Dorothy and Edward Allan Fund in support of Animal Welfare. www.ecfoundation.org.